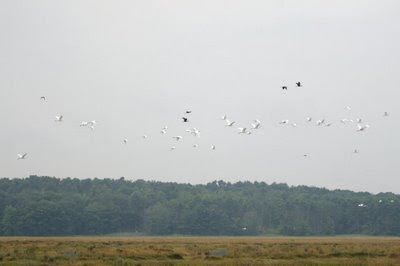 A couple days ago I birded the pannes off Eastern Road, in Scarborough (Maine) Marsh with my friend Doug Hitchcox. It was an absolutely stellar day, highlighted by three Stilt Sandpipers (life bird for the both of us) and three Northern Shovelers - a bird that is uncommon in Maine. Doug was nice enough to send me a couple pictures he took, and I'll share them with you. Although there are hundreds of fish-filled ponds in the Marsh, all the herons (and other large waders) congregated around one at a time. Doug and I assumed that this was either for social reasons or because it somehow made catching fish easier. Here is a shot of one of those ponds and its birds. I see Great Egret, Snowy Egret, juvi Little Blue Herons (they're white with blue/black bills instead of Snowy's yellow bills) and some dark birds that are either adult Little Blues or Glossy Ibis. Here are those same birds in flight. There were a lot of birds-of-prey around: Doug and I saw Cooper's and Red-tailed Hawk, Osprey, Bald Eagle and Northern Harrier. When the smaller raptors (Cooper's and Harrier) would buzz the marsh it was mostly sandpipers and other waders that would take to the air. When a pair of Eagles came into view, however, it was the herons that got spooked. The sight of nearly a hundred giant herons in the air above our heads was really something. Note the four Glossy Ibis in this shot (not sure what the dark bird in the back is...). Below the treeline I can see a Yellowlegs sp. (white rump, middle of the photo) as well as a bunch of smaller birds. Here's a shot of one of those Northern Shovelers. 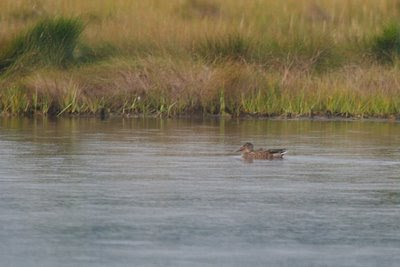 We were also pleased to identify a whole bunch of Green-winged Teal in the Marsh - birds we assumed to be first-of-years for the area. Thanks to Doug for the shots. I've never quite known what the proper format was for capitalizing the names of bird species. I was under the impression that no species were capitalized, unless the word was a proper noun, i.e. Baird's Sandpiper or American robin. From looking at my post below, I can see that I have been inconsistent. I capitalized "Black-legged Kittiwake" in the second "St. Lawrence at Tadoussec" paragraph, but kept "semipalmated sandpiper" and "semipalmated plovers" in lower case. Thanks to this site from Audubon, now I know that the formal rule is that all species names should be capitalized. Therefore, my below post should read "Semipalmated Plover" and "Semipalmated Sandpiper." I was correct, however, in keeping the "legged" in "Black-legged Kittiwake" in lower case. I will try to follow this format from now on. It always kinda weirded me out that there exists an entire civilized country north of Maine. In the States, Maine is thought of as the Great White North, all frigid and isolated. That there was a country that didn't even begin until after the most northern of Maine's northern forests had passed just seemed illogical. But exist it does! And, as proof, my girlfriend and I spent a couple days there, along the St. Lawrence River. So we left from Portland and headed north. Interesting stop: Mars Hill Wind Farm in Mars Hill, Maine. It's no secret that I love wind power, and I have to say that I was filled with pride at seeing Maine's only (for now) large-scale wind farm in full glory. Mars Hill, the hill, seems to rise out of nowhere (this is flat potato country), and really towers over the Mars Hill, the town. The 28 turbines were spinning like mad. I took these pictures at a gas station in town and while I was there I asked the woman at the counter how she felt about the project (some people living close to the turbines have complained about the noise): "Doesn't bother me, I don't live close to them." "Where does the power go?" I asked. "Canada." She replied with a smirk. One reason we wanted to go to the St. Lawrence was for the epic whale-watching. At a certain spot on the river, where the warm water of the Saguenay River meets the cold subarctic water of the St. Lawrence, science happens and lots of delicious shrimps and krill are created. Whales love it, and people love to look at whales. Done and done. Usually, people drive to Quebec City and then up along the north coast of the St. Lawrence to the town of Tadoussac, where the whale-watching is easier, but we decided to stay on the south coast and take a trip out of Riviere-du-Loup. Though the birds were very far away, there were thousands of peeps out there. Only a few groups came into range where identification was possible, and they were all semipalmated sandpipers. A small number of semipalmated plovers walked on the beach much closer to me. With some planning, and on the right day, this mudflat most likely produces some spectacular shorebirds. The wind was ferocious during our few days in Quebec. Unrelenting and intrusive. The wind made birding difficult (very hard to keep a zoomed scope steady) and our whale-watch uncomfortable. But there were birds. Specifically, there were Black-legged Kittiwakes. I had never seen a kittiwake before the trip, but then the boat returned to Riviere-du-Loup I had seen probably 15,000. And Minke Whales leaping out of the water. And Finback Whales, the second largest animal in the world. Here's a picture showing how rough the seas were. Those are kittiwakes, identifiable from, say, ring-billed gulls by the jet black wing tips lacking any white and yellow unmarked bills. There were very few other species out there: a few black guillemots, herring and black-backed gulls and an odd flyover greater yellowlegs. Also missed were cooler whales. Blue, Humpback and Beluga are all quite possible here, but the combination of rough seas and the necessity for a long haul back across the river to Riviere-du-Loup cut the trip a bit short. I would advise anyone looking to whale-watch on the St. Lawrence to make the trip around to the north side of the river at Tadoussac instead of trying to go from the south side. An absolutely beautiful little National Park on the St. Lawrence just west of Rimouski. Mountains really come out of nowhere and form huge cliffs at the riverside. The wind, again, was ferocious, and it hindered birding to a large extent, but I was able to see quite a few species. That's a shot of the muddy beach in the Baie du Ha! Ha! (Yes, that is what it's called. Translated into English it's Ha! Ha! Bay. I don't know what to tell you), which probably hosts lots of shorebirds when the wind dips below gale force. Around the rest of the park I saw the usual seabirds, gulls, black ducks, a single juvi kittiwake and a thousand or so of the park's famous eiders. Inland, I managed to avoid most of the boreal species I was hoping to see in Canada, but I saw a few more boreal chickadees and heard a small group of red crossbills at a treetop. A pair of nashville warblers were a nice surprise. I'd love to bird this place again, with more time. Rimouski is a very nice little city just a few miles from Bic National Park with a big ol' mudflat out front. I got there just as the tide was rising, but still caught over 30 great blue herons (the largest number I've ever seen at one time), 1000+ American black ducks (ditto), thousands of gulls (nothing unusual, however), red-breasted mergansers and a smattering of semipalmated plovers. I was a bit surprised that there were no other peeps out on the flats but, like at Riviere-du-Loup, things were pretty far away. Whelp, that does it. I had an absolute blast in this part of Canada and would love to return with less wind and more time to bird. Au revoir! There are more, but you know. Every birder knows. This year, though, I've come prepared. 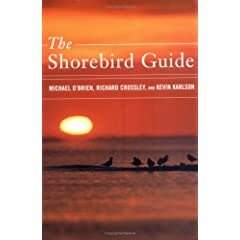 I got The Shorebird Guide. Look, I know I'm not exactly breaking new ground by writing about this book, but I'm justified by the excitement of being able to better identify a whole new group of birds. The book details about 75 species of shorebirds that are possible in North America. It uses photographs: lots of big beautiful photographs. Each species gets a full treatment, with photos of juveniles, breeding, nonbreeding and male/female plumages. Most helpfully, many of the photos include several species, mimicking the mixed flocks that are most often encountered out on the mud flats. Special attention is given to species that are likely to be mixed up most often (dowitchers, yellowlegs, etc). In short, I love it. The photographs are much more helpful than paintings for the detailed challenges that shorebird identification present. The GISS method provides probably the easiest framework for tackling a daunting flock. I'll be at several shorebird spots in Maine, Mass. and New Hampshire in the next day or two, and this book will be at my side the whole time. Black legs? Plump body? Straight, blunt bill? Short primary projection? I'm gonna go with a molting juvenile semipalmated sandpiper. Dark back? Single breast band? Half-orange bill? Breeding semipalmated plover. State officials in Delaware gave the OK to a plan between Delmarva Power and a wind farm developer that may lead to the first offshore wind farm in the USA. Great news, I say. But, just to get the ol' brain juices flowing, here are some lists of birds and sea mammals found off the coast of Delaware at different times of year (Look under "Lewes"). The Lewes pelagics usually head for the Baltimore Canyon, which is about 30 miles offshore, and the proposed wind farm would be 11.5 miles offshore. 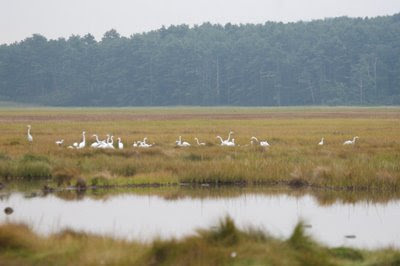 I'm not really sure what that means, but certainly a farm too close to shore or too close to New Jersey could effect birds migration to and from Cape May. Based on the map below, however, it doesn't look like that should be a problem.